A smooth, bright white coated paper facestock offering excellent print quality for thermal transfer printing up to 8 inches per second. With its permanent rubber-based adhesive, it offers high initial tack and excellent adhesion to corrugated surfaces and is an excellent option for a wide variety of applications, such as box, compliance, work-in-process, and indirect food labeling. 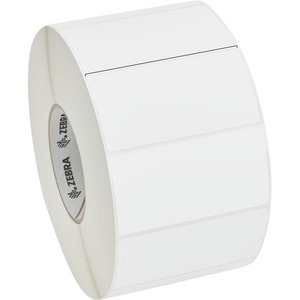 It is specially coated for use with the Zebra 2000 wax ribbon. This Item is Non Returnable. Product Description: Zebra Z-Perform 2000T, perforated coated permanent rubber adhesive paper, 2750 pcs.